Although business capital and GDP will grow (my detailed predictions are here), there is some crash to this economy. Bad news for older persons who planned to live off past investments: your capital will have to compete with the new projects of well-funded young people. That's part of why the stock market fell. It's not all good news for the young: they'll have to compete in the labor market with older workers who can no longer afford to retire; this is one of those rare occasions when GDP grows more than normal and so does the unemployment rate. Univ. of Chicago student Luke Threinen and I explain these results in more detailed in a working paper (available from NBER or from www.caseymulligan.net/w14446.pdf). This research is ongoing, so please check back here for updates, corrections, etc. For example, we would like to understand better the implications of Hypothesis G, which is not explored in the NBER wp. I just heard through the grapevine that University of Chicago graduate student Pedro Gete has also linked housing construction to the U.S. current account. I will report back when I learn more. Very interesting. If these predictions turn out to be correct 99% of public opinion and economists will have been wrong in their analysis. 1. Charles Calomiris has noted that one of the unique aspects of the crisis was the fact that financial firms managed to raise 430 billion in private external capital. Here is a link with firm data. If the losses were already embedded in expectations, why would there be an aggregate wealth effect? 3. There is some suggestions, for example mentioned in Browning, and Lusardi (1996) overview article, that residential housing equity has different wealth effects than other assets (for example if housing savings follows Shefrin and Thaler type behavioral savings model more than other assets). One question is if the households realized that the upward effects was partially air, in which case the wealth effect is less than the total losses. Household real estate wealth went up 6 trillion 2003-2007. Granted personal savings went down these years. But people who don’t want to/face high costs from moving don’t actually get a wealth effect if housing goes up, since their housing costs move correspondingly. If a lot of consumers knew there was a high likelihood that by the time they retired/moved the bubble would have burst the wealth effect from housing prices will be exaggerated (incidentally, this is why I think a behavioral savings is good for residential housing, a very illiquid asset). OK, but let’s not forget that institution that invented subprime mortgage securitization was literary the Federal Government, through it’s housing GSE:s. The logic and historical experience that implies that entrepreneurial innovations are ex ante good need not hold for policy innovations to serve politicians goal. In this case the goal of increasing house ownership among marginal borrowers. Another undertold story of the crisis is the government pushing banks to remove rational discrimination. According to HMDA data more than 50% of high-cost mortgages during the boom went to minorities, who represent less than 25% of the economy, and who have far higher default rates than average (which was why banks rationed credit in the first place). Reducing irrational discrimination is good, but Restricting rational discrimination is costly. Government crackdown on police profiling leads to higher crime, government push to reduce credit rationing led to higher default rates. 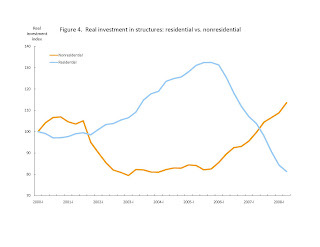 What is striking about the graph with non-residential structure investments is that it diverges with historical patterns, where these two follow each other with a lag. Interesting to see if it holds.